Spray small 2-cup capacity oval baker with vegetable spray. 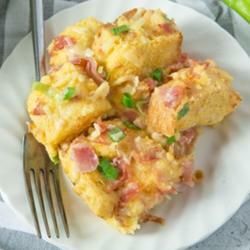 In bowl, combine eggs, milk, bread, green onion, cheese and ham; mix well. Pour egg mixture into baker. Bake 20-25 minutes or until egg mixture is set.